Form Description: This Basic Detailed Office Inventory Form has been designed to allow you to keep track of the number, manufacturer, and model number of the items you have in your office. On each line, there is also some extra space that you can make notes about each item, if you so wish. At the bottom of the form are some extra lines that you can use to customize the form for your specific office environment. You can download a PDF version of the "Basic Detailed Office Inventory Form" form absolutely free. You can also, for a small payment, download a fully editable version of the form that you can customize as you desire. (Don't know which format to choose? Here's how to make your choice.) What would you like to do? 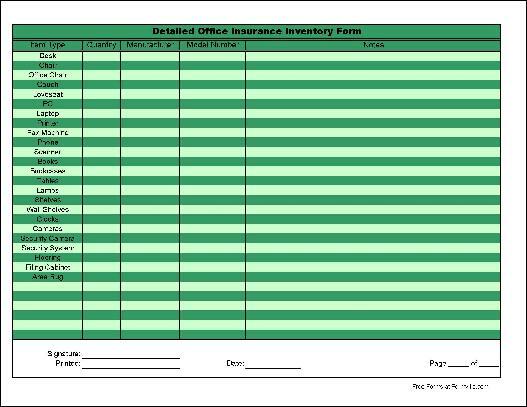 Formville's free "Basic Detailed Office Inventory Form" form is associated with the following keywords: insurance, basic, detailed, office, inventory.